Scole parish is in the local government district of South Norfolk. To the south it is bordered by the River Waveney and the border with Suffolk, and to the west by the parish and town of Diss. This parish contains not just the village of Scole, but also Billigford, Thelveton, Frenze, and the deserted village of Thorpe Parva (NHER 7958). Indeed, in the 19th century the parish was known as ‘Scole with Thorpe Parva and Frenze’, before reverting to simply ‘Scole’ when in 1935 the parishes of Billingford and Thelveton were abolished and joined to Scole. Scole was also recorded as Osmondeston, to which it is referred to in the Domesday Book. The name ‘Osmodeston’ derives from the Old English for Osmond’s enclosure or farm. However, there is evidence for occupation of this area during earlier periods. Of particular interest are a wide network of field boundaries (NHER 7947) around which debate still rages. Some of these field systems and parallel lanes, which are noted across Scole and into its neighbour to the north, Dickleborough, may be prehistoric, although this uncertain. Objects recovered from this parish also indicate prehistoric activity. There are several concentrations of potboilers (NHER 29514, NHER 29513, NHER 7960, NHER 11020), as well as a number of axeheads (NHER 30109, NHER 7935) and a Mesolithic bone point (NHER 15286). Even more unusually, there are a large number of sites where worked flints have been recovered, scattered across the whole parish (NHER 29511, NHER 7959, NHER 40443). Evaluation work undertaken in 2005 also recovered a ditch and pit thought to date to the prehistoric period. There is also evidence for occupation of this parish in the Bronze Age. There are four ring ditches possibly dating to this period (NHER 7972, NHER 7973, NHER 7974, NHER 12182), as well as a Bronze Age stone hammer (NHER 7953). Iron Age objects have also been recovered from this area, a period which is rarely represented in any quantity. An Iron Age brooch (NHER 37706), pottery sherds (NHER 44059, NHER 40443) have been recovered, the later representing a particularly rare discovery. A particularly interesting hoard of coins recovered to the south east of Scole village was deposited in the early Roman period, but also contains a number of Iron Age coins (NHER 1008), raising interesting questions regarding the local economy in the early Roman period. As with the majority of Roman site in Britain, evidence for the early period is limited, however the Roman settlement at Scole appears to have developed into a significant road side settlement or small town by the second century. The catalyst for this expansion appears to be the Roman Pye Road (NHER 7947), which ran along parts of the modern A140. This was the major land route between the town of Venta Icenorum at Caister St Edmunds and Colchester, and the Roman settlement of Scole is situated at the point that the road fords the River Waveney, and appears to have been an important stopping point. This position has lead Roman Scole to be associated with the 'Villa Faustini' site indicated on the Antonine Itinerary, although this link is uncertain. Occupation remains cover some 35 acres, and finds indicate occupation right up to the end of the Roman period. Modern buildings and roads now cover half of the Roman period site, and some of the areas subject to agricultural activity have been heavily damaged. However a £500,000 excavation (NHER 1007) in advance of the A140 bypass construction in 1993 recovered a large quantity of evidence, including thousands of coins, pottery sherds and metal objects. The proximity of the river has also resulted in the rare recovery of a number of waterlogged items. These include fragments of a Roman writing tablet, timber lined wells, timber framed buildings, and the remains of the first Roman roofing timbers to be recovered in Western Europe. It should also be noted that economic activity at Scole was not limited to the Pye Road. Evidence such as two rare unfinished wooden bowls (NHER 1007) also indicates that Roman Scole did not rely solely on the road for trade, as residents undertook industrial activity such as tanning, leather working, and smithing (NHER 7941). Iron smelting evidence has been recovered at a nearby site (NHER 1008). To the east a Romano-Celtic temple with a number of votive objects, and a possible cremation cemetery have also been discovered (NHER 30650), and there is evidence of another possible cremation cemetery (NHER 7945), 500m to the west of the Pye Road. Settlement also was not limited to the Pye Road, and evidence for Roman occupation has been uncovered some 550m to the west of the road (NHER 7934), and some 220m to the east (NHER 7954). Occupation of the area of Roman Scole is not limited to the Roman period, but also includes what were the first Iron Age buildings identified in Norfolk (NHER 1007), as well as the remains of a medieval settlement (NHER 9866). It should also be noted that there is evidence that the Roman settlement also extended to the Suffolk bank of the River Waveney. Evidence from the rest of the parish includes a number of Roman iron spearheads, pottery sherds and horse bones recovered from a site near the River, to the east of the settlement, which shows some evidence of earthworks (NHER 7955). Coins (NHER 7940), pottery sherds (NHER 39552) and metal objects (NHER 44059) have been regular finds across the parish. Of these a lovely 2nd century brooch featuring a wide enamelled design of a fish swimming in water (NHER 35320), a disc brooch with a Triskele pattern (NHER 31212), and a copper alloy mount depicting the god Mithras (NHER 32117) are particularly interesting. Despite this wealth of evidence for the Roman settlement of Scole, the actual occupation site appears to have become far less heavily used during the Saxon period. Very little evidence for the Saxon period, sometimes none at all, has been recovered from any of the sites where the remains of Roman buildings have been discovered. However, a number of objects from the Saxon period have been recovered from areas outside the village of Scole. These include Saxon pottery sherds (NHER 44058, NHER 30650, NHER 29520) a buckle (NHER 24814), a coin of Charles the Bald (NHER 22538), and a number of brooches (NHER 37706) and toilet implements (NHER 24354, NHER 35125). Of the villages, Thorpe Parva is now deserted, although the fact that it is mentioned by name in the Domesday Book indicates that it was occupied during the early medieval period. However the Domesday Book assigns both Thorpe Parva and Frenze only a small number of villagers and a low value. Indeed, the listing for Scole itself does not indicate any great wealth or size, and so it seems that the activity noted during the Roman period did not continue into the Saxon period. However, the position of Scole on the road that now forms the A140 was to result in a resurgence of prosperity during the medieval period. Evidence for parts of the medieval settlement have been recovered in the form of building footings, hearths and cropmarks (NHER 9866, NHER 7964, NHER 7945). Across the parish, pottery sherds (NHER 7959, NHER 18487), coins (NHER 24354, NHER 38053) and metal objects such as strap and harness fittings (NHER 24354, NHER 24814, NHER 29520) have been recovered, particularly along the route of the A140 where the NAU have been involved in watching briefs undertaken during construction work. Of particular importance in the life of the medieval villages are the churches, and four of the extant villages had a church during this period, as well as the now deserted Thorpe Parva (NHER 7958). The Hall and the Church of St Mary are the only surviving buildings, and the parish was united with Scole in 1482. The church itself was largely demolished around 1540, and the tower survives only due to its conversion into a dovehouse. By 1739 only one family lived in Thorpe Parva. Today less than half the round tower, originally constructed of flint and lined with medieval brick, survives. Aerial photographs indicate that the church was rectangular in plan, and it is believed to have stood within the southern end of the former village. Cropmarks and earthworks of the village also survive, as do the remains of a medieval moat. In a similar situation, Frenze village is also almost deserted. The remains of the church of St Andrew (NHER 11006), Frenze Hall (NHER 45743), and a small scattering of farmbuildings and the occasional house are all that survive. It therefore comes as no surprise that St Andrew’s may be the smallest church in the whole of Norfolk! The present building dates to the 13th and 14th centuries, but this may be just the nave of a previously larger village church, as it has undoubtedly suffered truncations on at least one or two occasions. St Andrew’s (NHER 11006) was closed in 1976 due to a lack of attendees, and has since passed into the hands of the Churches Conservation Trust. Inside, much of the floor area is filled with tomb slabs and brasses, and the church contains no less than six effigy brasses most of which depict the Blenerhaysett family who owned the manor here. The octangonal font, despite appearing plain, is actually fascinating as each of the eight faces of the bowl is carved with a different type of tracery, all of them current to the first half of the 14th century. Out of the five churches, three are dedicated to St Andrew. Along with Frenze, Thelveton church (NHER 11039) is also dedicated to St Andrew. It is a small church whose earliest identifiable details date to the 15th century. The church tower, which may have been round, collapsed in 1757, and was replaced with a bellcote. The interior is largely 19th century in feel due to a restoration in 1864 paid for by Thomas Mann, whose 1886 monument can be seen inside, along with a 15th century font. On the outside the large chancel makes the church look very much like two separate buildings pushed together, though the very fine red brick porch more than makes up for the irregularity. The church of St Andrew’s at Scole (NHER 7957) completes the trio. There is some remaining evidence for the church’s existence in the Late Saxon period, but the majority of the visible building dates to around the 14th century, before a heavy Victorian restoration subsumed the majority of the exterior details in 1874. Unfortunately the church was subject to an arson attack in 1963 and restoration in 1964, and as a result a generally antiseptic feel has been imparted, along with some very strong red brickwork on the exterior. However, this restoration did provide the church with a beautiful stained glass east window by Patrick Reyntiens, who also created the more famous baptistry window at Coventry Cathedral. The last church in the parish is St Leonard's church (NHER 7971) in Billingford. This church is on a track that rises north from Billingford windmill, and its partially rendered flint walls contrast with the aged red tile roof which presents a stunning contrast to the surrounding green fields during early summer. The tower, which may never have been completed, is the same height as the medieval nave, which has an original scissor-braced roof with occasional modest arched braces. Inside can be found one of the attractive East Anglian 15th century fonts, this one octagonal, as well as a good 17th century font cover. There is also a 15th century screen and bench ends, as well as some late medieval wall painting surviving high on the south wall and some fragments of late 14th century stained glass in the chancel and nave windows. The remains of medieval moated occur in a number of South Norfolk parishes, and this parish has two located to the north of the village of Scole (NHER 7951, NHER 7970), as well as two near Thelveton (NHER 11036, 11033). The parish continued to experience prosperity into the post medieval period, with the Scole Inn (NHER 15110) becoming a stopping point for stagecoaches and post office deliveries. This Inn occupied an incredibly influential position on the region's premier land transport routes during the period, and saw some forty coaches a day. The building was built for John Peck, a Norwich wool merchant in 1655, and is said to be one of the best examples in the country of its type, possibly one of the most sumptuous in England built solely for the purpose of offering hospitality. 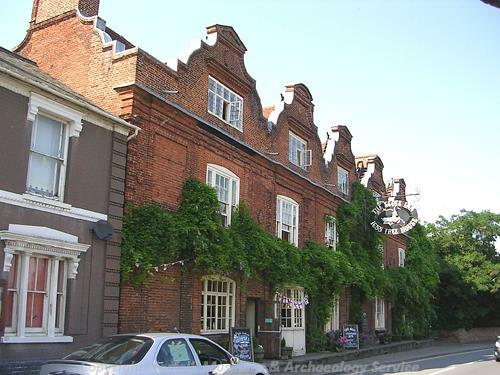 Scole Inn (NHER 15110) is built of red brick laid in English bond and has five wide sections at the front, each crowned with a Dutch gable, and the inn originally had an extravagant sign which extended right across the road. Inside, a solid staircase links all the floors, and it is up this that the highwayman John Belcher is said to have ridden to avoid the law. Other buildings of importance are scattered across the parish, a number along the route of the A140 (before the bypass work of the 1990s), such as Calvers Farmhouse (NHER 48376), Manor Farm Coach House and Stable (NHER 11021), and Clavers Farm Cottage (NHER 12108). Despite their proximity to the road, these buildings are all linked to the agricultural work that dominated the life of this parish. A number of buildings also remain in village of Scole itself, such as Gable End, Beam Ends and Three Ways Cottages (NHER 32845) Willow House (NHER 45875) and St Edmunds Lodge (NHER 48412). The majority of these post medieval buildings are timber-framed buildings dating to the 17th or 18th centuries with brick chimneystacks and tile roofs. Scole also saw building work undertaken during the industrial period. One of the most interesting projects was the Scole Railway (NHER 13579), which began life in 1850 and lasted some 35 years, closing in 1885. It was the brainchild of William Betts, Lord of Manor of Frenze from 1844, who owned Frenze Hall (NHER 45743) and estates and whose chief ambition was to become a successful market gardener. The line was built to allow him to export the fresh produce from his estate directly to London Covent Garden. The track was of standard gauge, and trains ran straight onto this line from the main lines of the Great Eastern Railway. The railway's total length reached seven miles, including a number of sidings near the Great Barn on the Frenze estate, where the produce was sorted and packed, and commenced from behind the Jolly Porter's Inn at Diss Station. The line also connected two large brickfields (NHER 32917), which William Betts created to increase the value of his line and to provide materials for the construction of workers' cottages. However, with the death of Betts in 1885, the farm passed to trustees and the market gardening ceased. The line closed and was pulled up in 1886, and a two-day sale of the components took place in 1887. A flax mill (NHER 45371) is also recorded in the parish, situated near the southern border, and believed to have been in operation between 1854 and 1895. A windmill building (NHER 7966) also survives, northeast of the church of St Andrew (NHER 7957). This three-storey red brick tower mill was built in 1799, and last used in 1883, after which all floors and machinery were removed. Of more splendid appearance is the Billingford Windmill (NHER 7969), a fully restored mill under the ownership of the Norfolk Windmills Trust. It was built in 1860 at a cost of £1300, and was the last mill to grind corn by wind power. It is said that local convection currents ensured that the sails were seen turning even when mills on higher ground were becalmed. There are also remains of more recent historic buildings, including those built to serve during World War Two. In Billingford woods, in the northern corner of the parish, lies part of an airfield built in 1941 (NHER 15169), which served as the headquarters of the United States Army Air Force's 100th Bombing Group. It was returned to the RAF in 1946, but was never used again, being sold off in 1956. However, the control tower and adjacent buildings have now been restored and opened as a museum and a memorial to the 'Bloody 100th', and in woodland nearby is a contemporary (and rare) sunken battle headquarters. Ruth Fillery-Travis (NLA), January 2006. Hunt's Directory of East Norfolk with Part of Suffolk, 1850.